In the shadow of the German elections which attracted an enormous attention from abroad – especially in Europe – , on September 29 parliamentary elections will take place in Austria to elect the members of the Nationalrat, the National Council. We here present a short overview of the Austrian political system, the party platforms concerning EU-issues and some speculation what the elections could mean for Europe. Basics – how does the system work? The 183 members of the Nationalrat are elected using a system of proportional representation, and are drawn from nine major constituencies, which correspond to the country’s provinces (roughly like the German Lander). These nine constituencies are then further broken down into 43 regional districts. Voters cast their ballots for one party with some opportunity to rank their candidate preferences at the regional and state-level, but at the national level party lists are closed. Using the Hare method a “statewide electoral quota … is used to allocate seats at … the regional constituency and state levels; seats won by a party at the regional constituency level – direct mandates – are subtracted from its corresponding statewide seat total, and the remaining mandates come from the party's state lists”. At the national level seats are assigned using the d’Hondt rule. Seats won at the state level are subtracted from a party’s nationwide seat total and remaining seats are awarded from the party’s list. Not unlike the German electoral system the Austrian system also requires parties to win a minimum percentage of the popular vote to enter parliament, the threshold being set at 4 percent. Where are we at pre-election? Currently Austria is governed by a coalition of the Social Democratic Party of Austria (SPÖ) and the Austrian People’s Party (ÖVP). Although these two parties have enjoyed a reasonably consistent and stable stay in power, their hold on politics may be slipping for a few reasons. Chief among these reasons is the involvement of both the SPÖ and ÖVP in corruption scandals, which has drawn heat from the public pushing traditional supporters away and potentially opening the door to protest voting. Results of the Austrian National Election Study indicate that the Social Democratic Party can expect approximately 25 per cent of the vote and the Austrian People’s Party around 19 per cent. Of the opposition parties both the Greens and the Freedom Party of Austria (FPÖ) expect to do well winning 12 per cent and 11 per cent of the vote respectively. 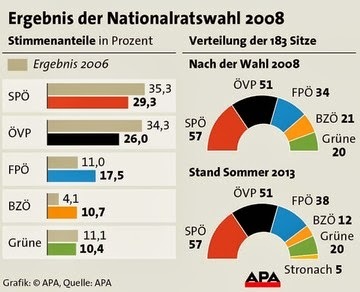 A massive surprise in the results is the slump in support for the Alliance for the Future of Austria (BZÖ), with this poll suggesting they may receive only 1 percent of the vote (in contrast to the 10 per cent won in 2008). This splintering of the vote presents a challenge for the ruling coalition and the emergence of new political voices is proving only to exacerbate this dynamic. It is not only the larger parties who are facing a challenge to hold on to their voters. The right wing party, the Freedom Party of Austria (FPÖ), now has to combat the rise in popularity of the Team Stronach party. Frank Stronach, an Austrian-Canadian businessman, announced his intention to enter Austrian politics earlier this year and since then he has enjoyed considerable success. In state elections this March his party won 12 seats, 11.3 per cent in Carinthia and 9.7 per cent in Lower Austria. Poaching some of the FPÖ’s key issues, Team Stronach has built a euro skeptic, market liberalized party platform. Similar to, but more radical than the Alternative for Germany (AfD), Stronach’s party advocates for a withdrawal of Austria from the Euro and a new plan to address the crisis hit states of southern Europe. Before Team Stronach burst onto the scene the FPÖ “declared electoral goals were to increase its vote substantially and to nominate the next Austrian Chancellor”. These declarations have since fallen into the background. If current projections prove true, Team Stronach will enter the Nationalrat on Sunday (polls see the party at 6-7 per cent). Should this dark horse break the threshold it will do something that the Alternative for Germany could not and introduce a [radical] anti-euro voice at the national level. Where do the parties stand on Europe? Team Stronach is not the only EU-critical voice in Austrian politics. But let’s begin with the more EU-friendly positions (something we are more used to here in Germany). The social democrats are – unsurprisingly – in favor of a “socially just” Europe. Social security and equal opportunity policies on all levels are all in the bag. Combating youth unemployment in Europe, the introduction of a financial transaction tax and more stringent regulation of the financial markets are their key issues. They also promote a stronger European Parliament and the extension of the European zone of stability in order to promote democracy and peace. The SPÖ election manifesto includes an extensive part on European security policy and defends a common European foreign and security policy to preserve peace. Under the heading “A more socially just Europe” we find also demands for a sustainable economic recovery in Europe, energy security, consumer protection, combating climate change, strengthening human rights and anti-discrimination, and a stronger Europe to capitalize on globalization. No specific mention of the euro zone or the sovereign debt crisis – obviously not a pre-election best seller in Austria. This is as specific as the conservative election manifesto gets on euro zone and European governance issues. Both major parties have much in common with their German sisters, the CDU/CSU and the SPD, see here. Despite all similarities in their positions on Europe, the coalition partners do not always agree on all aspects of “more Europe”. One hot potato is Turkey – should it become an EU member or not? With or without a referendum in Austria on the topic? SPÖ is for a "privileged partnership" and enhanced cooperation in some areas, but the ÖVP is sceptical of a Turkish accession to the EU and demands a “specially tailored partnership” or (also) “privileged partnership” (a term coined by Bundeskanzlerin Merkel). Negotiations on Turkish accession were put on hold after the demonstrations in Istanbul this summer and some critical voices were heard from the SPÖ. Austrians will most probably have to cast their vote in a nation-wide referendum before Turkey can become an official EU member state - at least this is what the SPÖ has promised. The right-wing “liberals” campaign with a “love-thy-neighbour” policy (which does not really embrace foreigners). As far as the EU is concerned, they are “committed to … cooperation within Europe according to the basic principles of subsidiarity and federalism”. Europe, however, “shall not be reduced to a political project of the European Union”. The FPÖ campaigns for an immediate stop of all payments to hard-hit by the debt crisis euro zone countries. They want Austria to leave the ESM and EFSF and pay less into the EU budget. They oppose debt pooling in the euro zone and want stronger control of financial transactions (FTT not mentioned). Also not mentioned in their election manifesto, but covered by the media is their support of splitting the euro zone into a North and South euro. The Greens want nothing less than a European social union with joint economic policy and hard regulation against financial speculations – all this free of nuclear power. They plead for a Green New Deal: an ecological and social tax reform in Europe, phasing out nuclear power to replace it with renewable energy, and the international implementation of climate treaties. They want a common European tax policy, financial transaction tax and human rights protection. The final goal of their EU policy is the United States of Europe. They support the ESM, but were against the Cypriot bail out. The other party of right-wing “liberals” call themselves pro-European, but also EU-critical. The obvious distance between the citizens and the “often detached from reality and arrogant political elite of the EU” is threatening the goals of European integration. They propose “a new order of the EU” in their election manifesto and mean a classical two-speed Europe – a core of closely integrated countries surrounded by “orbiting” countries which do not wish to join all common policies. Interestingly, the core is defined as the net contributors to the EU budget. They are against Turkish accession to the EU. Support the FTT – this seems to be the common denominator of all candidates. The election manifesto of NEOS is very succinct. The (literally) four sentences on Europe mention a "reinvention" of the EU – with clear structures, directly elected commissioners, budget discipline and a common economic policy. NEOS is for Europe of the regions, and not the nation states. And for European citizenship characterized by "actively participating citizens". Election predictions are always at best looking to the numbers and hedging a bet, and in the case of the Austrian election the result remains unclear. Certainly one should take into account the stability which characterizes Austrian politics. With few lapses the country has been governed by a grand coalition of the SPÖ and the ÖVP, and as Kritzinger explains, “Even though decreases in the SPÖ and ÖVP vote shares suggest that Austrian voters are not supportive of the performance of the two government parties since the last election, it is still striking to see that nevertheless a majority of Austrian voters consider the grand-coalition between the SPÖ and the ÖVP the most preferable”. It may very well be that the governing coalition can coast along, but the rise in strength of opposition parties may prevent this. Should the current governing parties fail to win a majority of the vote it may come to the creation of a coalition between three parties. Unlike in Germany, however, it is completely inconceivable that the three present opposition parties: the Greens, Team Stronach, and the FPÖ would unite to form a government. There is simply too much ideological difference between them. Further, the pledges of parties to reject coalition with certain parties makes it difficult to ascertain what three way combinations are possible, should the grand-coalition fail to win a majority. If the current coalition wins again, we don’t expect any (big) changes in Austrian policy on Europe. If SPÖ and ÖVP lose their majority in the national council, the second most likely coalition would be SPÖ, ÖVP and Grüne. All three are big fans of the EU and if there are any changes at all, they would probably be in the direction of centralising even more powers in Brussels. Other combinations are less probable and would be far more interesting, but we have to wait and see what the coming Sunday will bring. In any case, the Austrian elections may produce some interesting results.